Detailed information about the biological and metallurgical objectives that were designed for Olympus compound microscopes of the BH era (AH, BH, CH, CK, IMT) can be found in the Olympus High Quality Optics catalogue on the downloads page. The specifications of the biological objectives that were designed for Olympus compound microscopes of the BH-2 era (AH-2, BH-2, CH-2, CK2, CK40, IMT-2) can be found in the Olympus LB Objective Series for Biological Use catalogue on the downloads page. Objectives for the BH, BH-2 and other Olympus microscopes of this era have the series, for example “SPlan”, in front of the magnification. Objectives for the BX and other more recent Olympus microscopes have the series above the magnification, and cannot be used with older microscopes. The following tables are intended as a quick reference to the letters that Olympus used on its objectives in the BH and BH-2 era. The “short mount” (36.65 mm parfocal) and the “long mount” (approximately 42.5 mm parfocal) objectives were intended for microscopes of the BH era (AH, BH, CH, CK, IMT) and earlier models. For photomicrography, they should be used with the FK photo eyepieces. 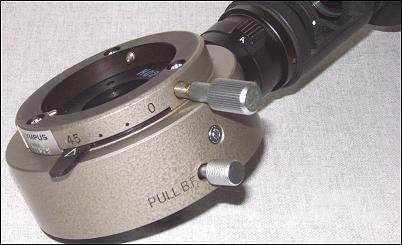 The eyepieces for viewing do not include an “L” in their designation, for example Bi WF10×. The 45 mm parfocal long-barrel (LB) objectives were intended for microscopes of the BH-2 era (AH-2, BH-2, CH-2, CK2, CK40, IMT-2). For photomicrography, they should be used with the NFK photo eyepieces. 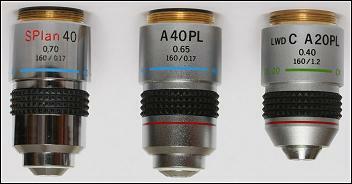 The eyepieces for viewing include an “L” (indicating long barrel) in their designation, for example SWHK 10×L, WHK 10×/20 L, WHK 15×L or CWHK 10×/18L. N Strain free, for interference contrast. On the 36.65 mm parfocal and “long mount” lenses, these numbers appear below the numerical aperture. The metallurgical objectives are intended to be used with reflected light from a vertical illuminator that is fitted between the stand and the head. They can also be used with transmitted light via the substage condenser, but a vertical illuminator is still needed to provide the proper 210 mm tube length or a tube lens. For the M, MPlan, Neo and NeoPlan 36.65 mm parfocal objectives for the BH microscope, the illuminators are part grey and part black. The BH-MA is for the brightfield M and MPlan objectives, and the BH-RLA is for the brightfield/darkfield Neo and NeoPlan objectives; the BH-RLA can be distinguished by a knob labelled “PULL BF”. The objectives are corrected for the longer tube length (210 mm) caused by the vertical illuminator. A few of these illuminators are all black, but they can be distinguished from the BH2 versions by the absence of the “∞ f=180” label. For the MA, MDPlan, MSPlan, NeoDPlan and NeoSPlan 45 mm parfocal objectives for the BH-2 microscope, there were 2 series of illuminators. The first series is all black, the BH2-MA Brightfield Vertical Illuminator for the MA, MDPlan and MSPlan objectives, and the BH2-RLA Brightfield/Darkfield Vertical Illuminator for the NeoDPlan and NeoSPlan objectives; the BH2-RLA can be distinguished by a knob labelled “PULL BF”. Both black illuminators were replaced by the cream BH2-UMA Universal Vertical Illuminator, which can be fitted with the BH2-UBF brightfield cube and/or the BH2-UDF darkfield cube; the active cube can be selected by a sliding knob on the front. Both series of BH2 vertical illuminators include the tube lens (f = 180 mm) that is essential for these infinity-corrected objectives, and are labelled “∞ f=180”.